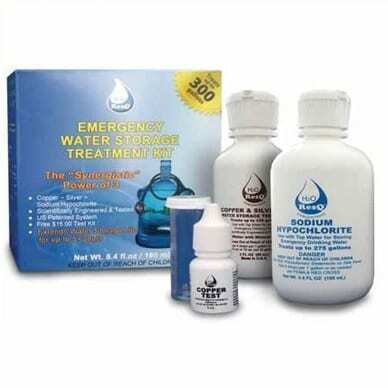 Preserve your drinking water for 5 years with this Emergency Water Storage Treatment Kit! This kit treats up to 1,249 litres (330 gallons) of potable water to keep it safe for when you need it. Not sure if there has been contamination since treatment? No problem! Use the included test kit to make sure your water is up to snuff! Sodium Hypochlorite also included in case of contamination. Three bottles are included with this kit: Copper-Silver Ion Treatment (Water Stabilizer), a Copper Test Kit (for testing potentially contaminated water), and Calcium Hypochlorite tablets (a shock treatment for contaminated water).